PHILADELPHIA — Brad Stevens, the coach of the Boston Celtics, knows a few things about basketball. At least one of his players refers to him as a “guru.” And about an hour after the premature confetti had been cleared from the court at Wells Fargo Center on Saturday night, Stevens casually mentioned that he was familiar with the 40-odd plays that the Philadelphia 76ers run during end-of-game situations after timeouts. “I mean, we’ve watched them all,” Stevens said, somehow delivering this information without a trace of conceit. But even Stevens needs help, especially given the injuries that have left moth holes in his roster this season. 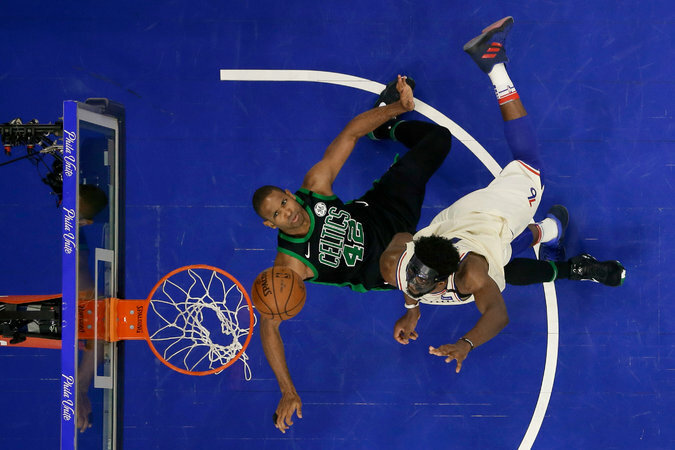 And he knows where to find it: Al Horford, a power forward in his 11th season who has emerged as a uniquely stabilizing force for the Celtics in these N.B.A. playoffs. The Celtics are riding the rapid rises of young players like Jayson Tatum, Jaylen Brown and Terry Rozier, who are not behaving like young players. But it is worth emphasizing ad nauseam: These are the same Celtics who lost Gordon Hayward to a gruesome ankle injury on the first night of the season and Kyrie Irving to knee surgery last month. Now, following their 101-98 overtime victory on Saturday, the Celtics are one win from sweeping the 76ers in their Eastern Conference semifinal series. Game 4 is Monday night in Philadelphia, a city where confetti has become a four-letter word and where the Celtics could clinch a second straight berth in the conference finals. “We have a great opportunity in front of us,” Horford said. He may never win prizes for fiery oratory — Horford, 31, tends to be impassive with his postgame remarks — but his steady demeanor is part of what makes him invaluable to the Celtics. Not much bothers him, least of all the unfair reputation that he vanishes in big moments. He is not LeBron James (Who is?). But Horford, operating with the wisdom accumulated over 10 trips to the postseason, has his fingerprints all over this series. ■ He took turns defending the 76ers’ starting point guard (Ben Simmons) and their starting center (Joel Embiid). Few players have that sort of versatility, and it is no coincidence that Simmons and Embiid are struggling. Also worth noting: Horford managed to go all of Game 3 without a foul, a tightrope walk that Embiid, for one, thought was baloney. That sort of attitude does not bode well for the 76ers moving forward. ■ Horford urged his teammates to keep their composure as arena workers scrambled to clear the court of confetti at the end of regulation. Oh, right, the confetti: It came pouring out of a courtside cannon after the 76ers’ Marco Belinelli made a long buzzer-beater at the end of regulation. The problem was that it was a 2-pointer, not a 3-pointer, and only tied the game. Whoops! ■ Horford trusted his coach in an important situation. The Celtics were trailing by 1 with less than 10 seconds left when Stevens motioned for a timeout, just as Horford was about to receive an entry pass in the post against the 76ers’ Ersan Ilyasova. Steven wanted to concoct an out-of-bounds play that he thought would be more favorable for his team. Sure enough, the Celtics cleared space for Horford on the inbounds, who took a lob over the top of the 76ers’ Robert Covington and scored on a layup to give the Celtics the lead for good. ■ Finally, Horford made the game’s most crucial defensive play when he stole the 76ers’ ensuing inbounds pass and was fouled. He made both free throws, sealing the win. “Al just made a heck of a play,” Stevens said. Even as 76ers Coach Brett Brown continues to express hope that his players are learning from these playoffs, he was careful after the game to avoid blaming his team’s inexperience for their various late-stage catastrophes — and perhaps for good reason. The Celtics have loads of young players, too.